Tandoori Chicken is probably one of the most popular dishes in Indian restaurants in the west. But you need a tandoor to make it, right? Not quite - you can do it on a barbecue or grill, but you can also do it in a standard oven. You won't get the smoky char on it, but it's still pretty good! Cut slashes in your chicken pieces - right down to the bone. Mix all other ingredients together in a bowl, and put the chicken pieces in - make sure they are all well-coated. Cover the bowl with plastic film and put it in the fridge for at least 2 hours, but overnight is preferable. Preheat your oven to 160°C (320°F) if it's a fan oven, or 180°C (356°F) if it isn't. Place the chicken pieces on a wire rack over a roasting tin and cook for 20 minutes. Remove the tin, turn the chicken pieces over and brush with any spare marinade. Cook for another 15 minutes, then turn the oven up to 190°C (374°F) fan, 210°C (410°F) conventional. Turn the chicken over again and brush with marinade if you have any left. Serve with a squeeze of lemon, rice or naan, and raita and relishes/pickles. The video above is from the Keef Cooks YouTube channel. 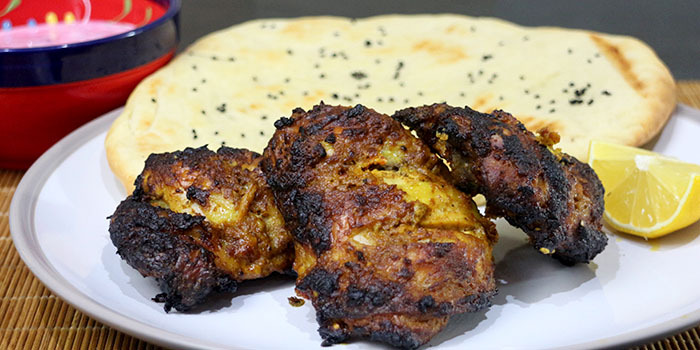 Click here to see the video recipe of Tandoori Chicken on YouTube. If you want your chicken to be bright red, as it sometimes is in restaurants, use some red food colouring. Prep time: 10 minutes. Marinading time: 2 hours.